A span is a single unit of work in distributed tracing. We'll use a sample Jaeger application to show the lifespan of a span and how it reach the backend. In the OpenTracing realm, as well as in other parts of the distributed tracing world, a “span” is the name given to the data structure that stores data related to a single unit of work. In most cases, developers just worry about instantiating a tracer and letting the instrumentation libraries capture interesting spans. How they actually reach a backend like Jaeger’s can be somewhat of a mystery. Let’s try to clear out some of this magic. For this article, let’s focus on what happens when we assume the defaults for all components involved. So you’ll have to remember that what actually happens in the background in your own implementation might differ from what we describe here, depending on your configuration. We’ll use a sample application with the Jaeger Java Client, but other Jaeger client libraries for other languages act in a very similar manner. During the bootstrap, the Jaeger Java Client will build an instance of RemoteReporterbehind the scenes, which starts a daemon thread and is responsible for flushing the spans stored in the buffer (see JAEGER_REPORTER_FLUSH_INTERVAL). This reporter will build an instance of the UdpSender, which just sends the captured span using Thrift via UDP to a Jaeger Agent running on localhost. Depending on the Tracer’s configuration, an HttpSender could have been used instead. Once an instrumentation library or the “business” code starts a span, the Jaeger Java Client will use the JaegerTracer.SpanBuilderto generate an instance of JaegerS. This instance includes a reference to a context object ( JaegerSpanContext), including a TraceIDand SpanID. Both hold the same value for our span, as it’s the root of the tree, also known as the “parent span”. The RemoteReporter will simply add the span to a queue and deliver the control back to the caller, so that no IO-blocking will ever occur that might negatively impact the actual application being traced. Needless to say, no more work happens in the “main” thread for this span. The Jaeger Agent is the daemon that runs very close to the instrumented application. Its sole purpose is to catch spans submitted from instrumented applications via UDP and relay them via a long-lived TChannel connection to the collector. After its quick appearance at the Agent, our span reaches the Jaeger Collector via the TChannel handler at SpanHandler#SubmitBatches, responsible for dealing with batches in Jaeger format. Other formats, such as Zipkin, would have different handlers. At this stage, a span might go through a pre-processing routine and/or might be filtered out. Under normal conditions, though, spans will then reach SpanProcessor#saveSpan . If we had more spans in the batch, we’d see this method being called once for every span. 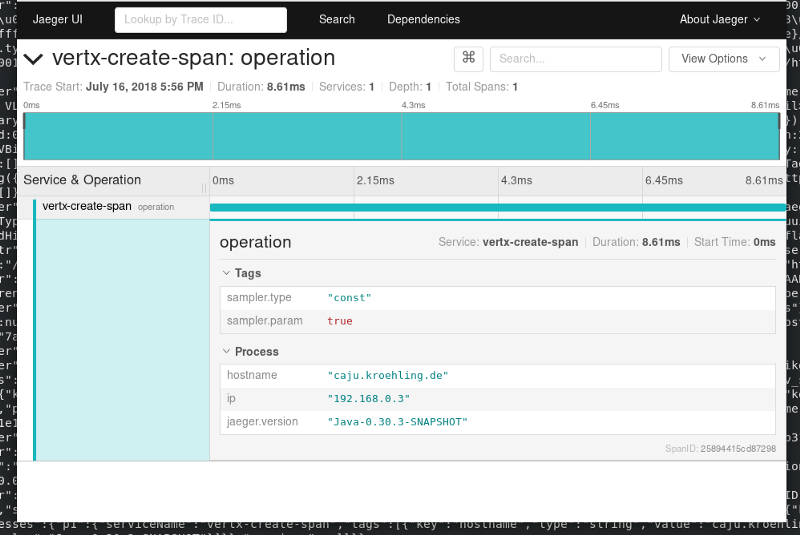 A “Span Writer” will be employed, which can be a Cassandra, Elasticsearch, Kafka or in-memory span writer. How it looks like in the concrete storage is left as an exercise to the reader, but a peek into the schema file for Cassandra or Elasticsearch might reveal quite a lot of details. It’s worth noting that, from this point and on, we stop referring to our span as “span”: for almost all cases after this, it is treated as a fully fledged trace, that happens to be composed by a single span. 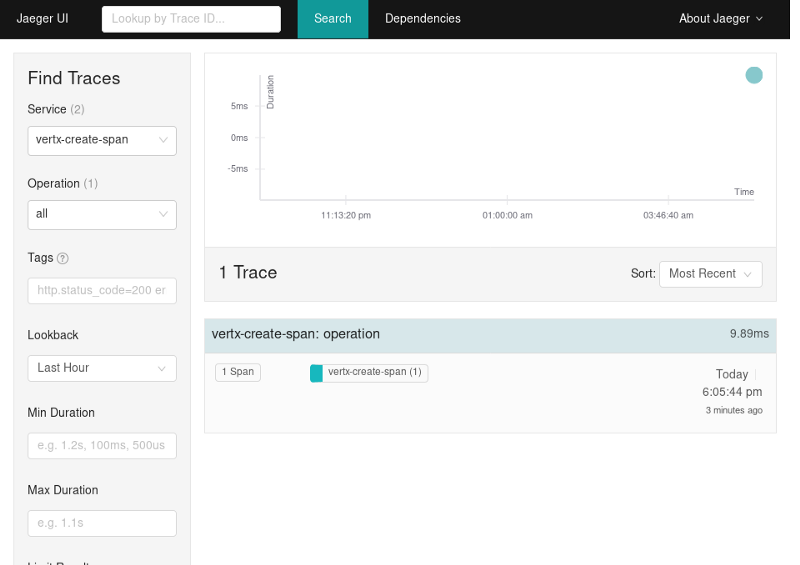 At this point, our trace is in storage, ready to be retrieved by the UI via the query component. We’ve covered pretty much all stages of the span’s life, from its genesis up to where it’s finally used to provide insights about the instrumented application. From this point, a span might appear in several afterlife scenarios, like as a data point in Prometheus, or aggregated with other spans in a Grafana dashboard somewhere. Eventually, the storage owner might decide to clean up older data, causing our span to cease to exist and closing the cycle. Published at DZone with permission of Juraci Paixao Kroehling , DZone MVB. See the original article here.